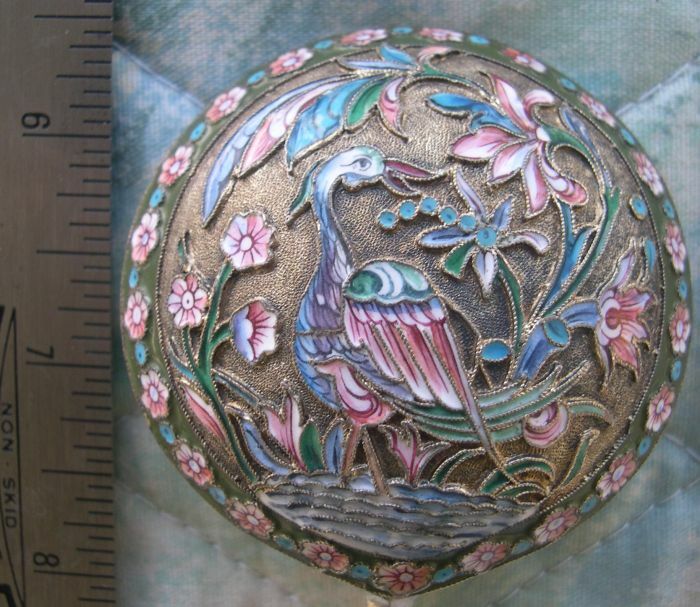 The gorgeous and awesome silver and enamel products which were produced by the talented silversmiths of Imperial Russia for the Czar and the wealthy nobility are among the most beautiful enameled silver objects ever produced. 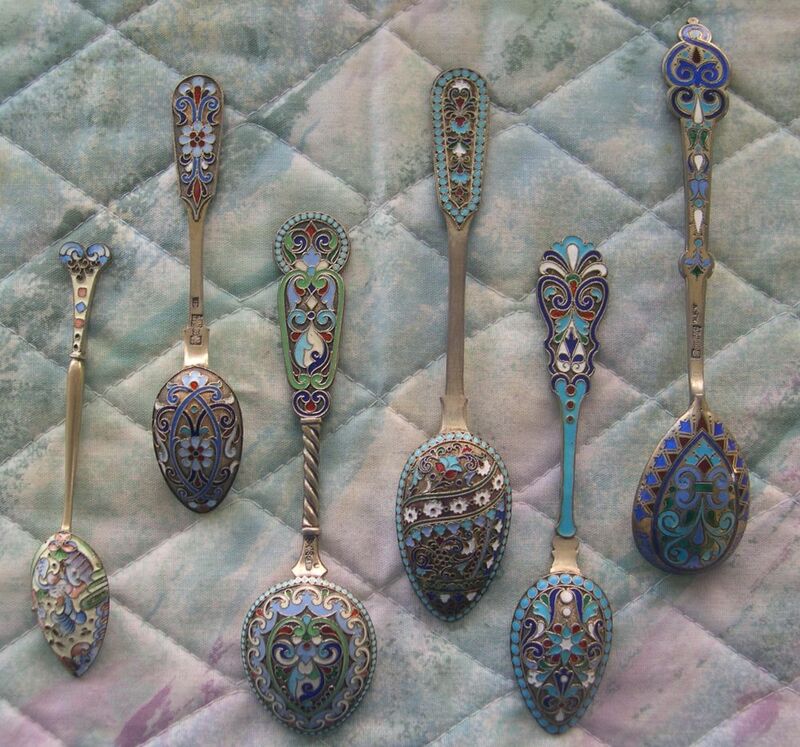 The combination of several collections has allowed me to present the largest group of enameled Russian silver spoons on the internet (as of this writing). 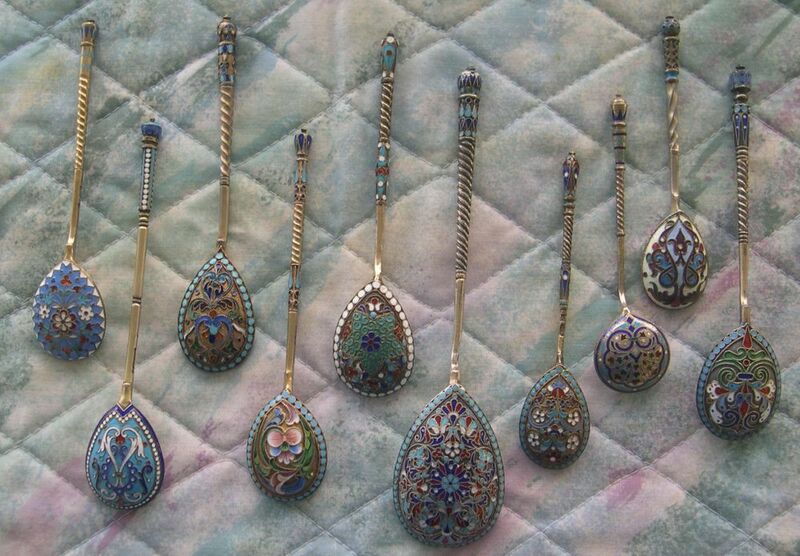 The most important name among Russian silversmith is that of Faberge. None of the spoons pictured here are a product of that workshop. Caution must be exercised as a number of fake Russian enamel silver objects have been created and are available in the antiques markets. 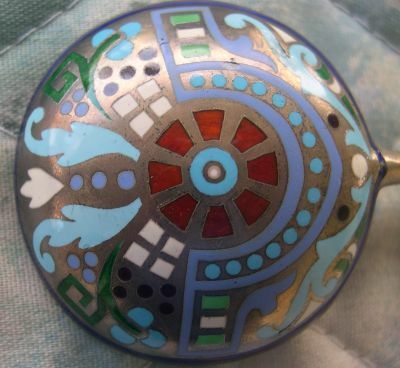 Most of these fakes are for Faberge and other very prominent silver houses and for Russian Judaica silver. 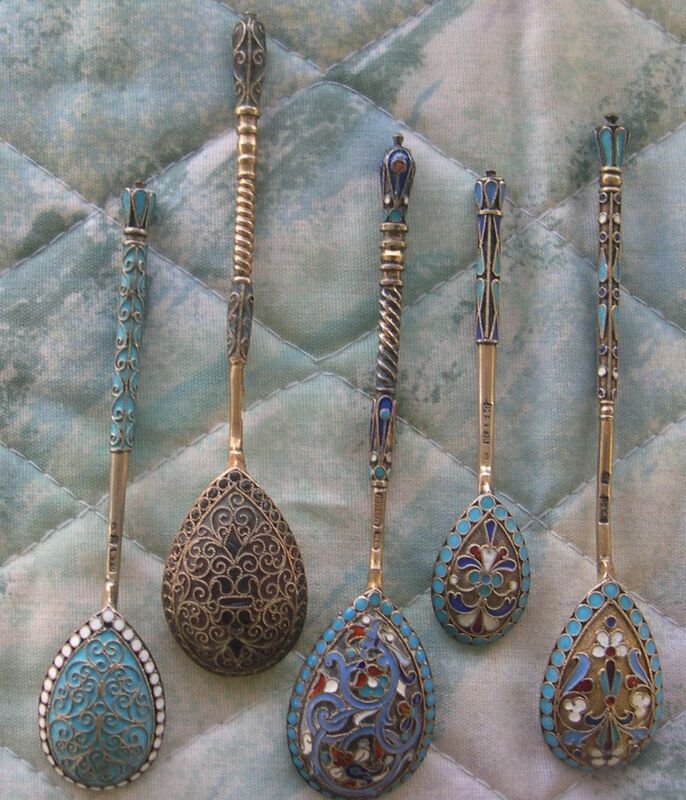 While I am not an expert in Russian silverwork, I suspect that all of these spoons are true examples of the artwork of imperial Russia. However I have identified some that have questionable marks and they are shown in a separate exhibit. In 1917, the Bolshevik revolution swept through Russia and disrupted the established order. Most of the nobility were either killed or ended up in exile. For those who made it to safe havens, they often sold their precious silver, gold, jewels, gowns etc. to raise money to support their lifestyles. The Bolsheviks (communists) also seized huge amounts of precious items and periodically sold them into the international markets to raise money. Also some of the seized goods were melted and refined into silver and gold bars. In addition, some peasant families were able to acquire precious items and hide them for decades. After the collapse of the Communist empire, many of these items were also sold into the international markets. The Russian nobility was very fond of elaborate dinner parties and social get togethers. 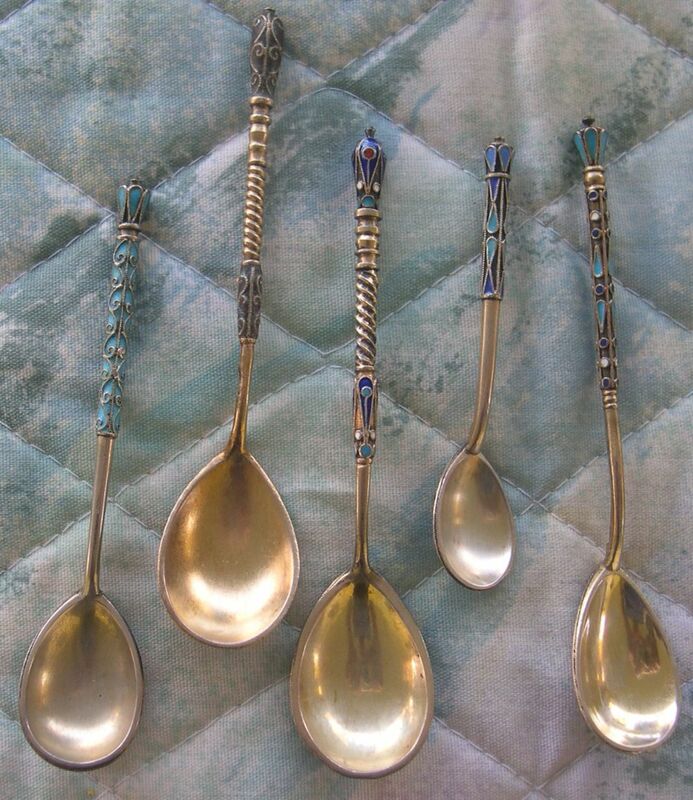 Spoons of this type were meant to impress the guests and to show the wealth and power of the party giver. In most cases these spoons were originally part of sets. Over the years the sets have been broken up into their individual components and very few intact sets exist in the world. 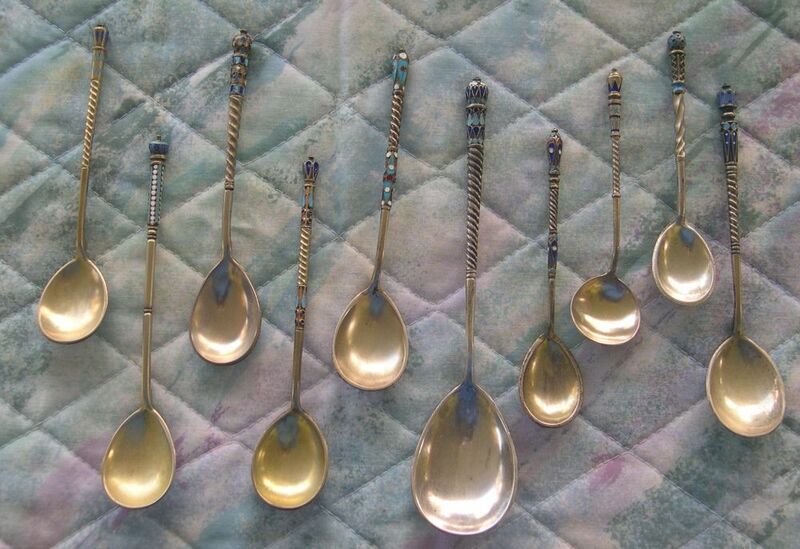 One set of 12 matched coffee sized spoons in a fitted case was sold by Christies Auction House in London for $5614 (plus buyer premium) in Feb. 2011. In October of 2013, Skinners sold a very nice set of 6 demitasse (4.25") in a fitted case for $6000 (click for picture). It is quite possible that you have a matching piece or a very similar spoon. This presentation is not exhaustive and many other styles of equal beauty are still available in the marketplace. I particularly enjoy the variety of the individual pieces and delight in the craftsmanship exhibit by these pieces. 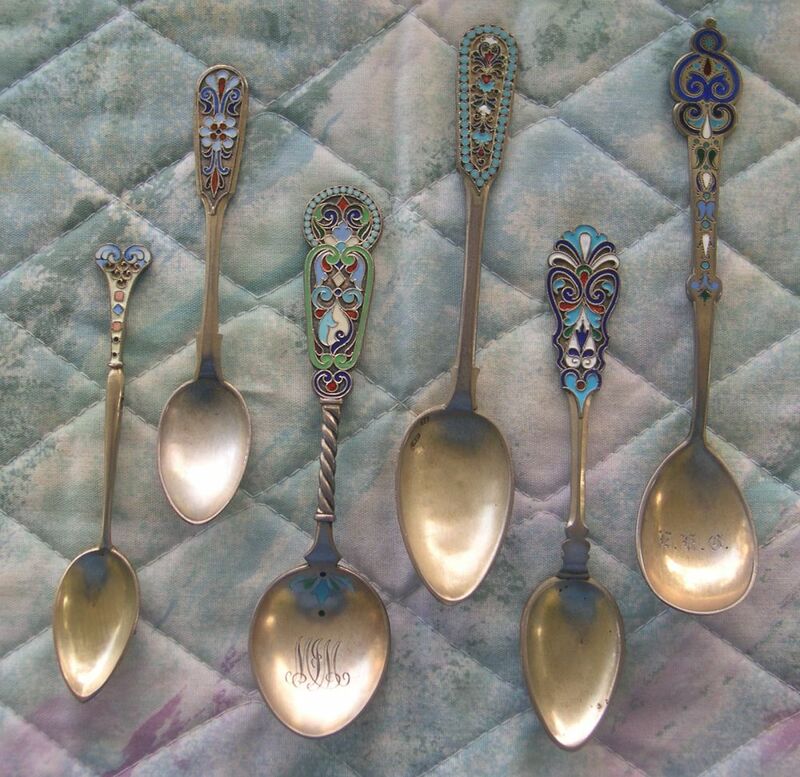 All of the spoons are marked as being 84 zolotnic silver (875/1000). All have a manufacturer mark (but they are usually difficult to read). some have a city mark for Moscow or St. Petersburg. I have not been able to assign them to an individual workman in most cases. At this time in history, when the table was set, the spoons were turned face side down. Thus the detail work was on the back of the bowl so that guests would see the gorgeous workmanship when they sat down for dinner. Interesting Russian enamel spoon which has been engraved "New York" in a modern script style. My guess is that an immigrant was very happy to be in New York.